Situated at the centre of Cahir town, just 7 km from the Apple Farm, Cahir Castle is one of Ireland's leading heritage sites. It's history dates back to the 12th century when Conor O'Brien built a fortification on an island in the river Suir. Then in 1375, the powerful Anglo-Norman family, the Butlers came into the possession of the castle. They had been granted a Barony in Cahir for their loyalty to the English crown. The Butlers have been associated with the castle ever since. Over the centuries they considerably rebuilt and extended the building. 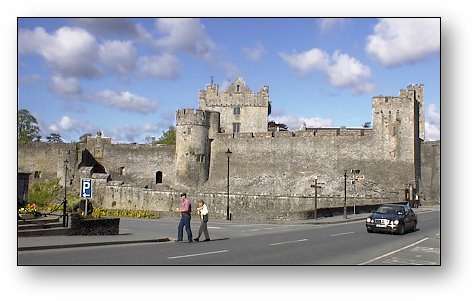 During a disturbed time in Irish history in the late sixteenth and the first half of the seventeenth centuries Cahir Castle came under siege three times and each time it was taken or surrendered. The first time was in 1599 when the forces of Queen Elizabeth 1st attacked the castle because the Butlers sided with the Irish against her. The artillery of the Earl of Essex did considerable damage to the castle walls. In 1647 the occupants surrendered to Lord Inchiquin and three years later they abandoned the castle to Oliver Cromwell without firing a shot. However the Butlers maintained possession following the signing of articles in the castle in 1652. In 1961 Cahir Castle came into the possession of the Irish State following the death of the last owner and has become one of the leading tourist attractions in the region. When you visit the castle you will be given a guided tour and you can also view an audio-visual presentation on other local historic sites. Both of these are recommended to receive the full value from your visit. Admission costs € 3.00 for adults, with reductions for groups, families, senior citizens and students. The castle is open all year round.